﻿ Doyt Perry Stadium - Ohio. Find It Here. Doyt-Perry Stadium is located on the campus of Bowling Green State University. 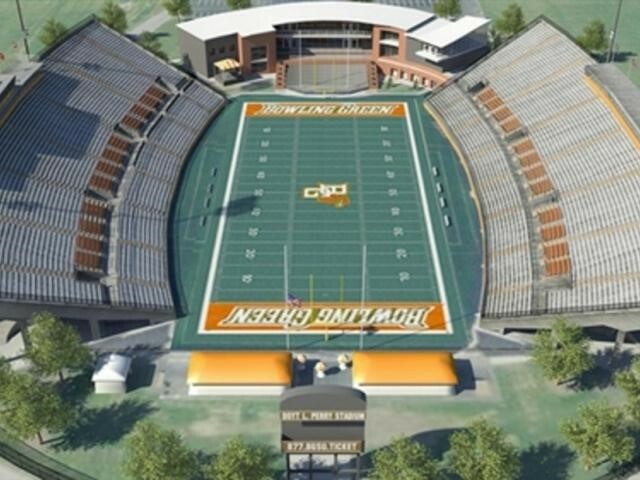 It is primarily used for football, and is the home field of the Bowling Green Falcons football team. It opened in 1966 and originally held 23,232 people. Recent renovations and new NCAA seating regulations have increased the listed capacity to 23,724. The Sebo Center was built and enclosed the north end-zone. It houses band seating, luxury suites, offices, training facilities and box offices. The grass field was also replaced with a Fieldturf artificial surface.